I’ve always felt like making friends is an awkward endeavor. Growing up, I had one friend, Linsey, who I spent all of my time with. Sure, I was friendly with other people and had fun with other kids, but Linsey was my best friend and my other relationships were just not as good as that one. As I have grown, I’ve realized that many of my difficulties came from a) just being a weird, nerdy kid and b) being an introvert. It was a tough transition to allowing those parts of myself transition from things that brought me shame to aspects of myself that I embraced and found God at work in. Then I entered into full-time ministry and found that familiar awkwardness again. 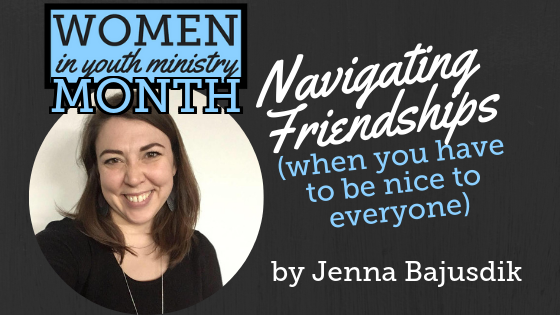 When your role requires you to be friendly with everyone at your church and community, and you value brutal honesty with a smidge of irreverence, how are you supposed to navigate making friends? I needed friends I could be real around, friends who understood the layered complexities of being in ministry but would sit and watch (read: eat snacks and thoroughly discuss) the Bachelor with me. I found instead a lot of people who wanted me to be their personal pastor, taking but not giving. I found people who wanted to use me as their chance to express their thoughts about our church and how things should be done/situations should be handled/money should be spent. I found people who expected me to live a perfect life and were shocked and disappointed when they came over and my closets weren’t perfectly organized, or I shared my struggles. I even found people who left me out of gatherings or kept their distance because they assumed I would be too busy or that an extension of friendship would be too big an obligation for me. It brought me to my knees before God. I asked for the strength to rely on Him, for Him to soften my heart towards these people I had found so that I would not become bitter, and I asked for true friends. As He so often does, God provided. He gave me the ability to rely on Him. He gave me a softer heart that cared for people who were not caring for me. And ultimately, He did provide a small but solid group of friends. We don’t always see eye to eye on every topic (#parenting), but I can be myself with them and they don’t expect me to be Wonder Woman. It started with continuing to put myself out there, reaching out when it wasn’t easy. I had to let my guard down and give myself permission to be my weird, nerdy self. I realized that some people thought I lived a perfect life because I was too afraid to let them see my fallibility. I was so scared to be judged that I put up walls and kept myself too busy and prayed for people but never asked for prayer. My journey toward real friendship started with loving myself and being a better friend to my own soul. That being said, there will always be people who are living out of their brokenness and only want to receive your friendship or use you or any number of other hurtful things. But for me, God used that season in my life to refine my heart for myself and for others. Making friends you can be completely yourself with at church is one of the things no one tells you might be hard as a leader, but it is so important to keeping yourself sane that it’s worth the effort. ABOUT JENNA: Jenna leads the middle school ministry at Orchard Hill Church in Pittsburgh, PA where she has served for the last 10 years. She is a wife, a mom of 3, and a lover of snacks, dance parties and naps with fluffy pillows and heavy blankets. If she has any spare time, she’s most likely to be found wandering the aisles of Target or renovating her home. You can find her on Instagram at @bajuszik or email at jbajuszik@orchardhillchurch to connect, chat or hire her to speak.